I read this book when I was in elementary school in Ashland, KY, probably between 1990 and 1998. It was a paperback, with the cover primarily blue, maybe with the main character on the front in dark sunglasses. The protagonist was a young boy, I think a cub scout or boy scout. Another boy (I think, a bully), throws a firecracker at him as a prank, and it explodes in his face, blinding him. The rest of what I remember of the book was him adapting to his new handicap and coming to accept that he may never regain his sight again (although I seem to remember that his vision started to come back, at least partially, near the end). I did not get a chance to read the first part of the book, as the binding had failed and a decent chunk was missing, including likely the scene where he was actually blinded, although I picked up a fair amount from context. There was a scene where he went to a school for the blind and just sat on the bed. When his roommate asked why he was doing nothing, he excused himself by saying "I'm blind" whereupon his roommate pointed out that they were blind too, and it didn't stop them. I think the roommate also introduced him to the practice of attaching tactile tags to clothing to let him know what color it was. There was a scene using basic echolocation where he learned to get an impression of the room's dimensions by clapping once and listening. And lastly, I remember there being a scene where he confronted the bully who blinded him and we learn that the psychopathic monster he's been building up in his head is just a kid who made a mistake and feels horrible about what happened. Follow My Leader, by James Garfield? 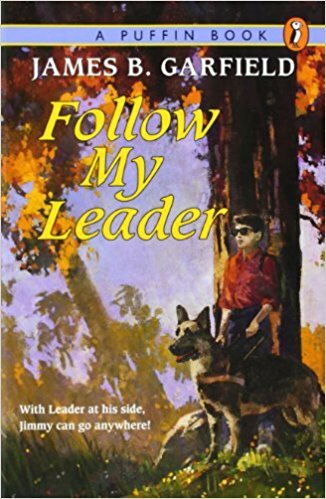 The book opens with the main character, Jimmy Carter, playing baseball - this could be what you're remembering as scouting. The cover does have the main character on it, wearing dark glasses. The book was published in 1994, so it's within the time frame. I don't know enough about it to say for sure, but it appears to match your description, from what I can tell. There was a book called Blind Like Me. I read it in the early 1960's. He was blinded by a firecracker. The cover didn't look like that, but that was 30 years earlier.